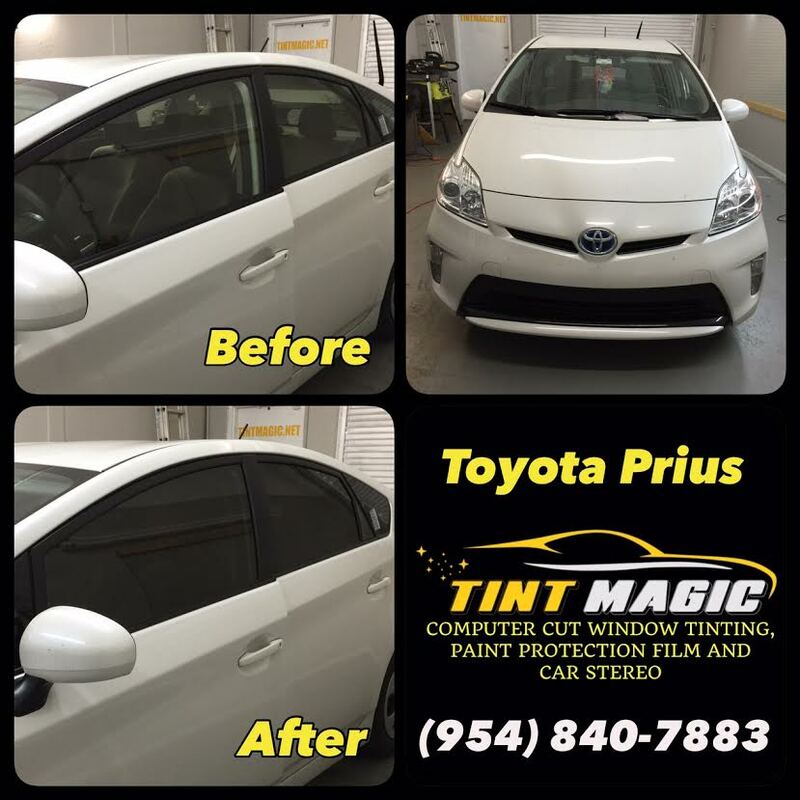 Toyota Prius at Tint Magic Window Tinting Coral Springs. We have applied Carbon Window Film 25% all over around the windows . Carbon window film is Non-Metal window film and non cause interference with radio, navigation system or electronic devices on your car. Call us for a free estimate! (954) 840-7883. As an enthusiast, you probably aren’t a fan of the Prius, but as someone shopping for the top in hybrids, it’s likely high on your list. With a 1.8-liter four and an electric motor that combine to make 134 hp, the Prius gets 51 mpg city and 48 mpg highway—if you drive it in the most efficient (translation: boring) manner. It’s the automotive equivalent of eating your vegetables; a plug-in version is also offered for those looking to up their green game. An all-new Prius debuts in early 2016. Combine an engine, an electric motor, and a battery pack and you get the hybrid car, a chimeric mixed-breed vehicle that has existed since the late 19th century but which never got much mainstream traction until Toyota gave us the Prius 15 years ago. This third-generation model arrived in 2010, which is the last time we were motivated to put one on a test track. It placed second to the Honda Insight in a three way comparison test soundly tromping a 1998 Chevrolet Metro but otherwise failing to impress anyone who loves cars and driving. It sells exceptionally well, however, to those who don’t fall in that category, largely on the strength of its other virtues. The primary one appears on the mid-dash information screen every time you shut it off, like a yummy food pellet that motivates lab rats to run mazes: fuel economy that can top 50 mpg around town. With a fourth generation model imminent, it’s time to gather some last impressions on this one. This generation was initially marketed in five trim levels, Prius One through Five, but the range now goes from Two to Five (the latter is not to be confused with the Prius V, a different, larger, wagon-y model). That’s because even buyers of an anti-car eschew base models and love added features and comforts. This example was a Prius Three (same as a Two but with proximity entry and navigation, basically).